Los Angeles is full of great places to take your dog on a walk. Besides the usual sidewalk by your home, there are numerous areas that welcome dogs to play. While we specialize in mobile Pet Grooming, we also know how to give our dogs a good time.Your furry friend wants to go out and enjoy the sunshine, but where to go? 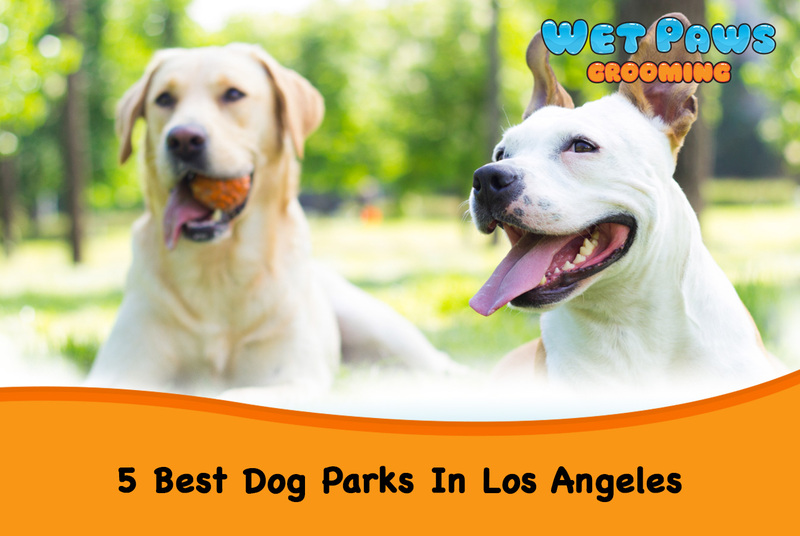 We have discovered the 5 best dog parks in Los Angeles—check it out and see which one fits you best. It’s considered to be the best dog park in Los Angeles. Here you can have a great view of the famous Hollywood sign, also the play area for your dogs is spacious and grassy. Another great thing about this place is that it has plenty parking spaces. The only thing that you need to keep in mind is that this is not an off-leash park, and there’s a $100 fine if you get caught. Located in the center of Beverly Hills, this beautiful park with large garden area provides a great and convenient place for people who live nearby and want to take their dogs to take a walk after work. It’s also a comfortable path to walk with dogs during daytime since the large trees help block out super bright sunlight. This park is a hidden gem in West LA and Beverly Hills. It’s a perfect place not only for your dogs but also for you to relax after work or on the weekends. It’s clean and quiet, allowing you and your dogs to fully enjoy the time there. It has very clean bathrooms, a walking path area, grass-bowling area, even a small golf range. All of these features make this park to be a quite scenic and lovely place to take your dog. If you want to get some exercise with your dog, this hiking place near Hollywood is probably going to be your first choice. There are popular hiking trails with scenic views, and you can walk your dog off leash. Also, bring some water for your dog if you decide to hike, since there are little water fountain for dogs. Finally, if you enjoy the ocean view, don’t hesitate to take your dog to this lovely and beautiful park along Ocean Avenue that offers breathtaking views of the Pacific Ocean and the coastal range. Make sure to keep your dog on leash but other than that, you can pretty much walk or run anywhere you want. Now it’s time to go pack your stuff and take your furry friends out there to enjoy the day! Don’t worry if they get dirty and you don’t feel like spending extra time to clean them up. Always feel free to reach out to us! Here at Wet Paws Grooming we offer professional mobile grooming service that will come right to you, and all we need is a place to park and a pet to pamper!